← Self-Training – 101: How to get started and keep going. IPAM Part 3 focuses on the integration of System Center Virtual Machine Manager (SCVMM) 2012 R2 into the IPAM managed environment. IPAM covers the entire Microsoft DHCP and DNS environment and monitors, manages and audits the deployment. Prior to Windows Server 2012 this was only possible with Spreadsheets, pieces of paper or expensive 3rd party applications. 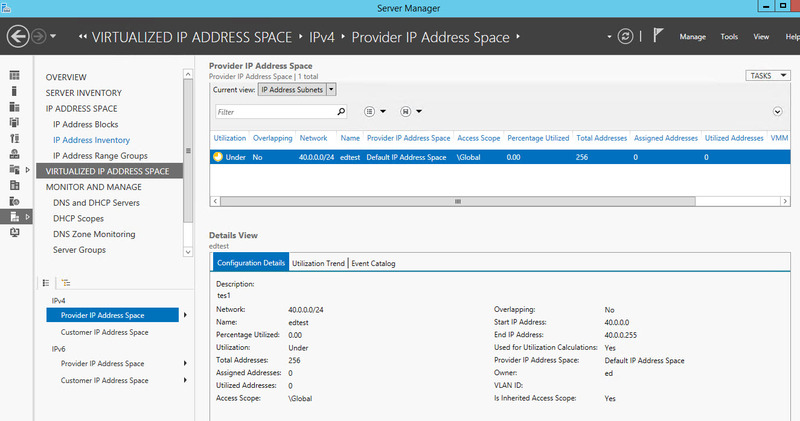 With the release of Windows Server 2012, this became a whole lot easier but there were missing areas. 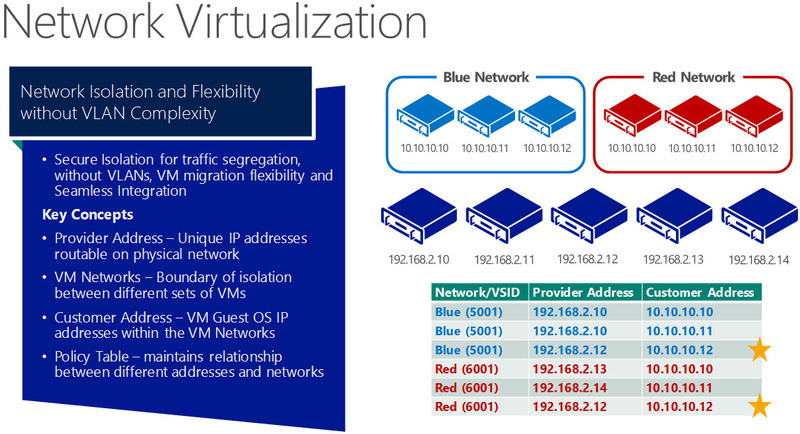 One important part of this was the virtual networks created and managed within SCVMM. 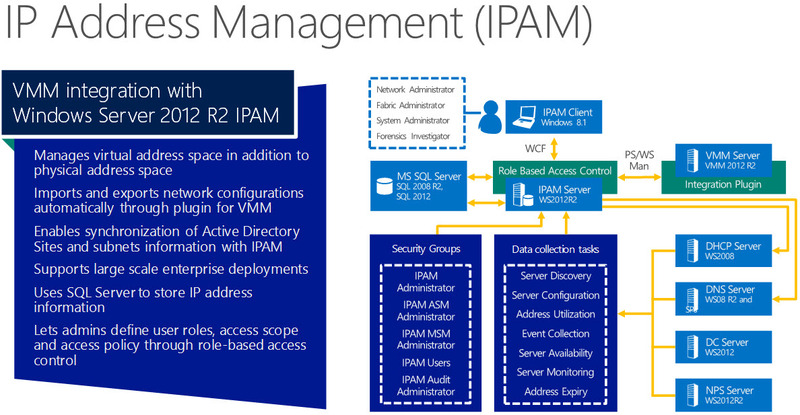 Windows Server 2012 R2 now covers this gap within the IPAM client console. All provider and client network addresses and subnets are included. This is all included in the box and requires no extra installation steps. Client and Provider networks addresses. What are those? System Center Virtual Machine Manager 2012 R2 allows for fully isolated network virtualisation using a protocol called NVGRE – Network Virtualisation Generic Routing Encapsulation. This technology is a topic own its own right and I will post about that another time. For now, if you want more detail try reading this post (be warned technical trauma ahead) NVGRE, a lighter way of looking at it is on the slide above. Each VM has a provider address and a customer address, allowing multi-tenant solutions with the same customer IP address on a network. It’s easy to see why keeping a close eye on these IP address ranges, subnets and individual IP addresses is a good idea. Once IPAM has been installed the integration plugin will automatically use Web Services Management (WS Man) to update the IPAM server with all the SCVMM virtual networking data. The IPAM client interface is then automatically populated with this data as shown below. Network Virtualisation is a very complex topic, but utilising the IPAM tools to monitor this requires no extra skills or training. A major win! Why not try them out now. Evaluate Windows Server 2012 R2 and Microsoft System Center 2012 R2 here along with a host of other Microsoft software. The final part in this tour of IPAM will cover the remaining new features.